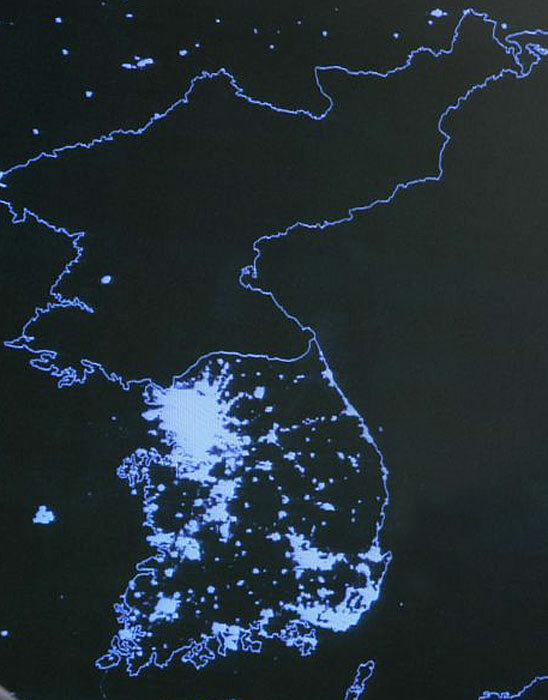 This one picture above of the Korean peninsula does a pretty good job of capturing the legacy of Kim Jong Il by comparing electricity usage at night between North and South Korea. 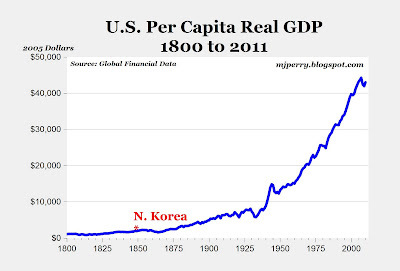 Here's another comparison: The CIA estimates that North Korea's GDP per capita in 2009 was $1,800. That's equivalent to the inflation-adjusted U.S. per capita GDP back in the year 1847, more than 150 years ago (see chart below). And South Korea's per capita GDP of $30,000 is about 17 times higher than its neighbor to the north. Left purrs over the low perCapita carbon footprint of DPRK... they can only dream of such a transformation of the US. Yeah, but they get free health care! True! I hear next year they're rolling out a brand new medical technology (for NK): Leeches. BTW, is it me or does son of Il resemble a retarded blowfish? NC, well stated (twice) indeed..
a comparison to South Korean GDP per capita would be more relevant than to US GDP per capita. I love this picture - I always show it to my students. This is what OWS is asking for. Thanks, Mark, I added a comparison to South Korea. Great Post Mark! One of the most powerful contrasts is that NK is economically where the U.S. was in 1850. I have frequently used the comparison case you presented earler that China is where the U.S. was in 1886. Great!!! Here a modern concentration camp. This means North Korea is a model state for Western environmentalists! It consumes no electricity! A paradise for greens! There appears to be not much more lights further north in China. Same conclusion could be made. N. Koreans don't need electricity. They burn dung. With NK free health care, all NK's have had their corneas polished like Ridik's so they can all see in the dark without light! Amazing! There is a 3rd stat comparing the average height of South Koreans to North Koreans, who are about 2.3 (men) and 2.6 (women) inches shorter due to malnutrition. "This means North Korea is a model state for Western environmentalists!" Yes, so how much cap-and-trade money will Romney/Obama have us send them to pay for our carbon sins? The Korea Times, December 13, 2011: Store owners caught for excessive lighting on outdoor billboards and heating of their buildings will face fines of up to 3 million won ($2,622) starting later this week, as part of nationwide efforts to save energy during the winter season, the Seoul city government said Monday.